You might think that the living room is the most "lived in" room in your house, but it's usually the kitchen! Whether you'd like to maximize your space, build an island or add a sleek, modern touch to your kitchen, our highly-experienced contractors will help you along every step of the way. Kitchen remodeling is no small decision, so we're more than happy to answer any and all of your questions. What’s the perfect finale to your kitchen cabinet refacing and remodeling project? Adding beautiful new custom kitchen countertops! With KitchenWorks, it’s easy to find a look to complement your new cabinets. We offer a variety of materials and hundreds of up-to-date styles and colors. Choose from ceramic tile, granite, Wilsonart and Formica laminate, and Corian countertops, and add the finishing touch you need to complete your new kitchen! Elegant and impressive, KitchenWorks custom granite tile kitchen counter tops offer the natural beauty of granite at an affordable price. With long-lasting ruggedness and easy-to-care-for practicality, Corian kitchen countertops are a mark of sophistication. From wood grains to solid colors, Formica and Wilsonart brand laminate countertops offer a vast selection of 240 different color bursts, patterns, and textures. 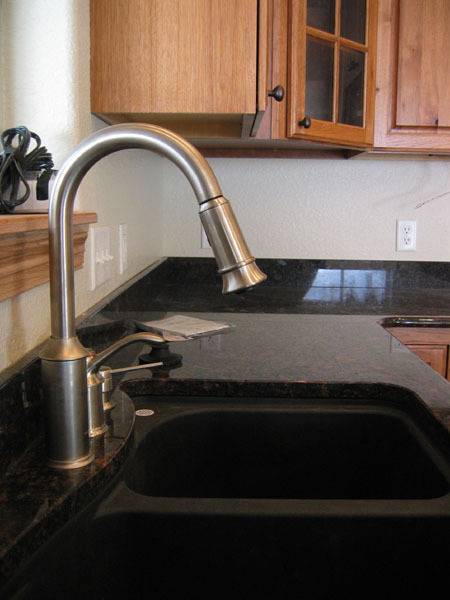 Heat resistant, beautiful, and practical, ceramic tile kitchen counter tops combine durability with distinction. from ceramic tile to granite kitchen countertops—our professional KitchenWorks staff will skillfully install them with your satisfaction guaranteed! If you are interested in our bathroom remodeling and renovation services or you would like to consult a professional on future remodeling project, please do not hesitate and contact Julie at 941-270-2677. We promise you full and immediate attention to your project ! !